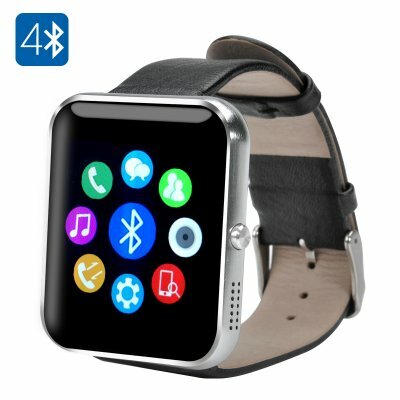 Successfully Added Bluetooth 4.0 Smartwatch – Toughened OGS Panel, Premium Leather Strap, Pedometer, Sleep Monitor, Sedentary Reminder (Silver) to your Shopping Cart. Keep an eye on your health, stay active and get a reliable companion for the outdoors – all in on simple gadget. This Bluetooth smartwatch comes with lots of great functions and apps for iOS and Android. This Bluetooth smartwatch is a great accessory for thet outdoors. It is waterproof and comes with a toughened OGS screen – so it will be able to handle a sunned scratch or two. The smartwatch features a Barometer - with it, you will be able to measure atmospheric pressure and predict weather changes. It also comes with an Altimeter that will help you determine altitude if you are a fan of hiking. Bluetooth 4.0 makes sure that the smartwatch can easily communicate with other device and comes with apps for iOS and Android. You will have lots of functionality that will improve your health and fitness tracking, as well as keep you in the know. Simply pair the watch with your smartphone and receive social media notifications and sync your text messages. With Android, you can also use the watch as a camera trigger. For fitness and health tracking, you have a Pedometer to count your steps, Sedentary Reminder to let you know when you’ve spent too much time behind the desk, Heart Rate Monitor to make sure you don’t overdo your workout and Sleep Monitor to ensure you get enough beauty sleep. The watch comes with a 250mAh battery and offers you up to 8 hours of continuous usage time and 72 hours on standby. With a compact 240x240 1.54 inch display, all your notifications will be conveniently displayed and an elegant leather strap will make sure the smartwatch is secured on your wrist. The Bluetooth 4.0 smartwatch comes with a 12 months warranty. Brought to you by the leader in electronic devices as well as wholesale Bluetooth smartwatches..